"Zayed" redirects here. For other uses, see Zayed (disambiguation). "Sheikh Zayed" redirects here. For the city, see Sheikh Zayed City. For other uses, see Sheikh Zayed (disambiguation). Sheikh Zayed bin Sultan Al Nahyan (Arabic: ٱلـشَّـيْـخ زَايِـد بِـن سُـلْـطَـان آل نَـهْـيَـان‎, translit. Ash-Shaykh Zāyed bin Sulṭān Āl Nahyān); 6 May 1918 – 2 November 2004) was the Ruler of Abu Dhabi for more than 30 years (6 August 1966 – 2 November 2004). He was the founding father and the principal driving force behind the formation of the United Arab Emirates, becoming the Union's first President (Arabic: رَئِـيْـس‎, translit. Raʾīs), a post which he held for a period of almost 33 years (1971 until his death in 2004). He is popularly referred to in the UAE as the Father of the Nation. Zayed was the youngest of four sons of Sheikh Sultan bin Khalifa Al Nahyan. His father was the ruler of Abu Dhabi from 1922 until his assassination in 1926. Zayed was the youngest of his four brothers. His eldest brother, Sheikh Shakhbut bin Sultan Al Nahyan, became ruler of Abu Dhabi after their uncle, Saqr bin Zayed Al Nahyan, was also assassinated in 1928. His mother was Sheikha Salama bint Butti. She extracted a promise from her sons not to use violence against each other, a promise which they kept. Sheikh Zayed was named after his grandfather, Sheikh Zayed bin Khalifa Al Nahyan ("Zayed the Great"), who ruled the emirate from 1855 to 1909. At the time of Sheikh Zayed's birth, the sheikhdom of Abu Dhabi was one of seven Trucial States along the lower coast of the Persian Gulf He also showed interest in falconry. It is normally held that he was born at Qasr al-Hosn in Abu Dhabi, with some sources stating that he was born in Al Ain. He is at least known to have moved from Abu Dhabi to Al Ain in 1927, after the assassination of his father. As Zayed was growing up in Al-Ain, there were no modern schools anywhere along the coast. He only received a basic instruction in the principles of Islam, and lived in the desert with Bedouin tribesmen, familiarising himself with the life of the people, their traditional skills and their ability to survive under the harsh climatic conditions. Zayed was appointed the governor of the Eastern Region of Abu Dhabi in 1946, and was based in the Muwaiji fort in Al Ain. At this time, the area was poor and prone to outbreaks of disease. When parties from Petroleum Development (Trucial Coast) began exploring for oil in the area, Zayed assisted them. In 1952, a small Saudi Arabian force led by Turki bin Abdullah al-Otaishan occupied the village of Hamasa in the Buraimi Oasis (the 'Buraimi Dispute'). Zayed was prominent in his opposition to Saudi territorial claims and reportedly rejected a bribe of about £30 million to allow Aramco to explore for oil in the disputed territory. As part of this dispute, Zayed and his brother Hazza attended the Buraimi arbitration tribunal in Geneva in September 1955 and gave evidence to tribunal members. When the tribunal was abandoned amid allegations of Saudi bribery, the British initiated the reoccupation of the Buraimi Oasis through a local military force, the Trucial Oman Levies. A period of stability followed during which Zayed helped to develop the region and took a particular interest in the restoration of the falaj system, a network of water channels which kept the plantations of the Buraimi Oasis irrigated and fertile. The discovery of oil in 1958, and the start of oil exports in 1962, led to frustration among members of the ruling family about the lack of progress under Sheikh Shakhbut’s rule. On 6 August 1966, Shakhbut was deposed in a bloodless palace coup. The move to replace Shakhbut with Zayed had the unanimous backing of the Al Nahyan family. The news was conveyed to Shakhbut by British Acting Resident Glen Balfour-Paul who added the support of the British to the consensus of the family. Shakhbut finally accepted the decision and, with the Trucial Oman Scouts providing safe transport, left for Bahrain. He subsequently lived in Korramshahr, Iran before returning to live in Buraimi. In the late 1960s, Zayed hired Katsuhiko Takahashi, a Japanese architect, to design and plan the city. Between 8–11 January 1968, the UK's Foreign Office Minister Goronwy Roberts visited the Trucial States and announced to its shocked rulers that the United Kingdom would abrogate its treaties with them and intended to withdraw from the area. In a seminal meeting on 18 February 1968 at a desert highland on the border between Dubai and Abu Dhabi, Sheikh Zayed and Sheikh Rashid bin Saeed Al Maktoum of Dubai shook hands on the principle of founding a Federation and attempting to invite other trucial rulers to join in order that a viable nation be formed in the wake of the British withdrawal. In 1971, after occasionally difficult negotiations with the other six rulers of the Trucial States, the United Arab Emirates was formed. Zayed was appointed to the presidency of the UAE in 1971 and was reappointed on four more occasions: 1976, 1981, 1986, and 1991. In 1974, Zayed settled the outstanding border dispute with Saudi Arabia by the Treaty of Jeddah by which Saudi Arabia received the output of the Shaybah oilfield and access to the lower Persian Gulf in return for recognising the UAE. Sheikh Zayed was determined to unite the Emirates into federation. His calls for cooperation extended across the Persian Gulf to Iran. He advocated dialogue as the means to settle the row with Tehran over three strategic Persian Gulf islands which Iran seized from the (future) UAE Emirate of Sharjah in 1971. The islands remain in Iranian hands, despite over three decades of UAE diplomatic initiatives. He was considered a relatively liberal ruler, and permitted private media. However, they were expected to practice self-censorship and avoid criticism of Zayed or the ruling families. Freedom of worship was permitted, and to a certain extent allowances were made for expatriate cultures, but this did not always sit comfortably in the eyes of the wider Arab world with Zayed's role as a Muslim head of state. Zayed did not shy away from controversy when it came to expressing his opinions on current events in the Arab world. Troubled by the suffering of Iraqi civilians, he took the lead in calling for the lifting of economic sanctions on Iraq imposed by the United Nations in the aftermath of the Iraqi invasion of Kuwait in 1990, despite Kuwaiti displeasure and opposition. Zayed was one of the wealthiest men in the world. A Forbes estimate put his fortune at around US$20 billion in 2004. The source of this wealth was almost exclusively due to the immense oil wealth of Abu Dhabi and the Emirates, which sit on a pool of a tenth of the world's proven oil reserves. In 1988, he purchased, for £5m, Tittenhurst Park at Sunninghill, Berkshire as his English home. At the time the British withdrew from the Persian Gulf in 1971, Zayed oversaw the establishment of the Abu Dhabi Fund for Arab Economic Development; some of its oil riches were channeled to some forty less fortunate Islamic nations in Asia and Africa during the decades that followed. Using the country's enormous oil revenues, Zayed built institutions such as hospitals, schools and universities and made it possible for UAE citizens to enjoy free access to them. We have always said that our people should voice their demands openly. We are all in the same boat, and they are both the captain and the crew. Our doors are open for any opinion to be expressed, and this well known by all our citizens. It is our deep conviction that Allah has created people free, and has prescribed that each individual must enjoy freedom of choice. No one should act as if they own others. Those in the position of leadership should deal with their subjects with compassion and understanding, because this is the duty enjoined upon them by Allah, who enjoins upon us to treat all living creatures with dignity. How can there be anything less for mankind, created as Allah's successors on earth? Our system of government does not derive its authority from man, but is enshrined in our religion and is based on = Allah's Book, the Quran. What need have we of what others have conjured up? Its teachings are eternal and complete, while the systems conjured up by man are transitory and incomplete. Land was also often distributed gratis. However, while this policy benefited many landless families, enormously wealthy clans and individuals were given free land grants in proportion to their status and influence with the royal family. His majlis (a traditional Arab consultation council) was open to the public. He allowed non-Muslim religious buildings, such as churches and a temple, to be built. Zayed was also in favour of certain rights for women, such as access to education and women's labour-rights, within traditional parameters. His views regarding women's rights were considerably more liberal than his counterparts in the GCC nations. After floods ravaged Yemen's Ma'rib Governorate in 1982, Zayed financed the construction of the current dam of Ma'rib in 1984. This was to replace the historical one that was damaged in antiquity, and support the country's agriculture and economy. The area of Ma'rib is reportedly from where his ancestors migrated to what is now the UAE. Controversy over the opinions of the Zayed Centre caused the Harvard Divinity School to return Sheikh Zayed's $2.5 million gift to the institution in 2000 as "tainted money." Former United States president Jimmy Carter accepted the Zayed International Prize for the Environment in 2001. The award included a monetary prize of $500,000 from the Zayed Centre, and Carter stated in his acceptance speech that the award carried extra significance to him, since it was named after his personal friend. There was similar controversy when the London School of Economics accepted a large donation by the Zayed Centre, to build a new lecture theatre in the New Academic Building in 2008. Despite student protests, the gift was accepted with the Sheik Zayed Theatre being the second largest lecture hall on the campus. Harvard's equivocation, the Carter controversy, and the engendering negative publicity, prompted Sheikh Zayed to shut down the centre in August 2003, stating that the Zayed Centre "had engaged in a discourse that starkly contradicted the principles of interfaith tolerance." In 1989, while he was hospitalized and undergoing a series of tests, the people of the UAE wrote him a personal thank-you letter. On 2 November 2004, Zayed died at the age of 86. He was buried in the courtyard of the new Sheikh Zayed Mosque in Abu Dhabi. His eldest son, Sheikh Khalifa bin Zayed Al Nahyan, took an increasing role in government beginning in the 1980s. Directly after his father's death, he became the Ruler of Abu Dhabi, and was ratified as the President of the United Arab Emirates by his fellow rulers in the Supreme Council. Zayed University, a government-sponsored higher education institution with campuses in Abu Dhabi and Dubai. Shaikh Zayed University, located in Khost, southeastern Afghanistan. It was built by the aid of Sheikh Zayed. Sheikh Zayed City in Greater Cairo, Giza Province, Egypt, built depending on a donation from Abu Dhabi Fund for Development, on directions of Sheikh Zayed. The Zayed International Prize for the Environment and Zayed Future Energy Prize are named in his honour. The Shaikh Zayed International Airport (Kukës) in the northern city of Kukës, Albania, was named after him. Shaikh Zayed International Airport (Rahim Yar Khan) located in Rahim Yar Khan, Punjab, Pakistan, is named in his honor. Shaikh Zayed Medical College and Hospital located at Rahim Yar Khan, Punjab, Pakistan, was named in his honor. Zayed bin Sultan Al Nahyan's Mosque, also known as Stockholm Mosque, in Stockholm, Sweden. A lecture theater was named in his honor at the London School of Economics. A Hafiz School in Gudermes, Chechen Republic, was named in the Sheikh's honor. The Sheikh Zayed Arab Falconry Heritage Wing at The World Center of Birds of Prey in Boise, Idaho which was set up through a donation from Sheikh Mohamed bin Zayed, son of Sheikh Zayed. The current dam in Ma'rib is also called "Zayed Dam." A street in Montenegro was named for his memory in 2013. Shaikh Zayed Hospital for children and another for women in Larkana Sindh Pakistan. Shaikh Zayed Hospital Lahore Punjab Pakistan, Shaikh Zayed Medical Complex Lahore. The 5th ring road in Kuwait is now named in honor of Sheikh Zayed bin Sultan Al Nahyan. The Sheikh Zayed Tower at The Johns Hopkins Hospital is named in his honor. One the main streets of the Berges du Lac neighborhood of Tunis is named in his honor. Sheikh Zayed Institute for Pediatric Surgical Innovation, Children's National Medical Center, Washington, DC. Sheikh Zayed Professorship of Cardiovascular Diseases at the Mayo Clinic. Sheikh Zayed Children Welfare Centre, a centre for orphaned children located in Mombasa, Kenya. 2018, during the Dubai Light Show, it is called that year "Year of Zayed", to celebrate 100 years since his birth. In 2018, a year dedicated in the UAE to the celebration of Zayed's life and legacy, the Founder's Memorial was opened in Abu Dhabi. The memorial consists of an open Heritage Garden and Sanctuary Garden at the centre of which is a cubic pavilion housing The Constellation, an artwork dedicated to Zayed's memory. Tahnoon bin Zayed Al Nahyan 1968 (age 50–51) Skilled Jiu-Jitsu practitioner and son of Fatima bint Mubarak Al Ketbi. He works in the banking sector. ^ a b c d Martin, Douglas (3 November 2004). "Zayed bin Sultan, Gulf Leader and Statesman, Dies". New York Times. Archived from the original on 30 July 2013. Retrieved 25 January 2014. ^ a b c d Hamad Ali Al Hosani. "The Political Thought of Zayed bin Sultan Al Nahyan" (PhD Thesis). Archived (PDF) from the original on 5 February 2017. Retrieved 15 April 2016. ^ a b c Killgore, Andrew I. (March 2005). "Sheikh Zayed bin Sultan Al Nahyan (1918–2004)". Washington Report on Middle East Affairs: 41. Archived (PDF) from the original on 5 February 2017. Retrieved 18 April 2013. ^ "Remembering Sheikh Zayed, the father of the nation". Khaleej Times. Retrieved 4 November 2018. ^ Rabi, Uzi (May 2006). "Oil Politics and Tribal Rulers in Eastern Arabia: The Reign of Shakhbut (1928– 1966)" (PDF). British Journal of Middle Eastern Studies. 33 (1): 37–50. doi:10.1080/13530190600603832. Archived from the original (PDF) on 9 May 2013. Retrieved 17 April 2013. ^ Al Hashemi, Bushra Alkaff (27 February 2013). "Memories of a simpler time". The National. Archived from the original on 2 May 2013. Retrieved 20 April 2013. ^ a b Joffe, Lawrence (3 November 2004). "Sheikh Zayed bin Sultan Al Nahyan". The Guardian. Archived from the original on 28 August 2013. Retrieved 18 April 2013. ^ "European falconers recall charm of Sheikh Zayed: 'If there was a room, he filled it'". ^ "ALAIN". The Report: Abu Dhabi 2014. Oxford Business Group. 25 March 2014. p. 228. Retrieved 18 April 2013. ^ The Rough Guide to Dubai. Rough Guides UK. 1 November 2016. ISBN 0-2412-9864-4. ^ "The legacy of Sheikh Zayed bin Sultan Al Nahyan, Father of the UAE". AMEinfo. 2 November 2004. Archived from the original on 29 April 2013. Retrieved 18 April 2013. ^ "Farewell Arabia (1968)". Special Operations History Foundation. Archived from the original on 29 April 2016. Retrieved 18 July 2013. ^ Helene von Bismarck (29 March 2013). 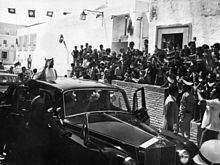 British Policy in the Persian Gulf, 1961–1968: Conceptions of Informal Empire. Palgrave Macmillan. p. 155. ISBN 978-1-137-32673-7. Archived (PDF) from the original on 5 February 2017. Retrieved 16 April 2013. ^ a b c De Butts, Freddie (1995). Now the Dust Has Settled. Tabb House. p. 209. ISBN 1873951132. ^ Building a city from the sands Archived 5 February 2017 at the Wayback Machine The National. 11 September 2008. Retrieved 15 April 2016. ^ Heard-Bey, Frauke (1996). From Trucial States to United Arab Emirates. UK: Longman. p. 339. ISBN 0582277280. ^ Maktoum, Mohammed (2012). Spirit of the Union. UAE: Motivate. pp. 30–34. ISBN 9781860633300. ^ Schofield R., Evans K.E. (eds) Arabian Boundaries: New Documents (2009), vol. 15, pp. viii–xv. ^ "UAE – News Reports". UAE Interact. Archived from the original on 4 May 2013. Retrieved 29 March 2013. ^ "Royals & Rulers". Forbes. 15 March 2004. Archived from the original on 10 November 2012. ^ "Tittenhurst Park". gen4trip.com. Archived from the original on 17 August 2016. Retrieved 3 August 2016. ^ "Tittenhurst Park". Beatles Blog. 14 May 2011. Archived (PDF) from the original on 5 February 2017. Retrieved 3 August 2016. ^ "Ascot Studios – Startling Studios Tittenhurst Park". Archived from the original on 5 August 2016. Retrieved 3 August 2016. ^ "The Beatles Bible – Ringo Starr buys Tittenhurst Park from John Lennon and Yoko Ono". Archived from the original on 20 August 2016. Retrieved 3 August 2016. ^ Hurreiz, Sayyid H. (1 January 2002). "Folklore and Folklife in the United Arab Emirates". Psychology Press. Archived (PDF) from the original on 5 February 2017. Retrieved 12 July 2016 – via Google Books. ^ a b WAM (29 July 2013). "Key aid projects during Zayed's time". Khaleej Times. Retrieved 9 April 2018. ^ a b Al-Qalisi, M.; Vela, J. (30 September 2015). "The dam that Sheikh Zayed built". The National. Retrieved 9 April 2018. ^ Greif, Lloyd (26 April 2008). "To see Jimmy Carter's true allegiances, just follow the money". Daily News. New York. Archived from the original on 8 July 2009. ^ Hodges, Lucy (20 November 2008). "The LSE's jaw-dropping £71m structure is a building to wow students". The Independent. London. Archived from the original on 28 March 2010. ^ Jacoby, Jeff (31 August 2003). "Harvard must give back tainted money". The Boston Globe. Archived from the original on 7 May 2007. Retrieved 30 April 2008. ^ "Montenegro names a street after UAE Sheikh Zayed". Balkan Business News. 12 June 2013. Archived (PDF) from the original on 5 February 2017. Retrieved 27 January 2014. ^ "2018 rings in Year of Zayed". Gulf News. 1 January 2018. Retrieved 4 January 2018. ^ "الصفحة الرئيسية". www.zayed.ae (in Arabic). Retrieved 4 November 2018. ^ "Bjj Eastern Europe – The Black Belt Sheikh: The Incredible Journey of Tahnoon the Godfather of Jiu-Jitsu". www.bjjee.com. 5 May 2016. Archived from the original on 13 August 2016. Retrieved 9 August 2016. ^ Blum, Sam (29 August 2015). "UFC to UAE: how an Abu Dhabi sheikh made Brazilian jiu-jitsu a national sport". The Guardian. Archived from the original on 14 September 2016. Retrieved 9 August 2016. ^ "Sheikh Tahnoon bin Zayed bin Sultan Al Nahyan – The World's Richest Arabs | Forbes Middle East". Forbes Middle East. Archived from the original on 9 December 2016. Retrieved 5 March 2017. ^ a b "UAE First Lady: Behind-the-Scenes Player". United Arab Emirates Abu Dhabi. 6 October 2004. Archived from the original on 20 December 2016. Retrieved 11 December 2016. ^ "Abu Dhabi Emirate Restructuring". United Arab Emirates Abu Dhabi. 15 December 2004. Archived from the original on 3 November 2016. Retrieved 8 December 2016. ^ "Stocks". Bloomberg.com. Archived from the original on 11 August 2016. Retrieved 10 August 2016. ^ "BinZayed Group". www.binzayed.com. Archived from the original on 9 August 2016. Retrieved 10 August 2016. ^ "Etihad Airways | MEADFA". www.meadfa.com. Archived from the original on 10 January 2017. Retrieved 9 January 2017. ^ Al-Dhahiri, Shamsa Hamad (December 2014). "Sheikh Hazza' Bin Sultan Bin Zayed Al Nahyan (1905-1958) Representative of the Ruler of Abu Dhabi in the Western Region". In El Reyes, Dr. Abdulla (ed.). Liwa Journal of the National Archives (PDF). United Arab Emirates: Emirati National Archives. pp. 25–46. Retrieved 5 February 2017.